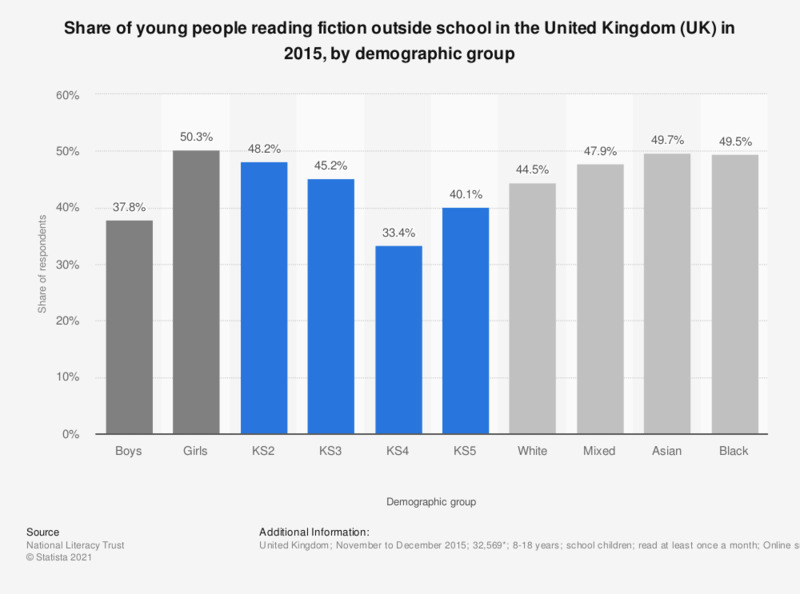 This statistic illustrates the proportion of young people reading fiction books in the United Kingdom in 2015, by demographic group. Among school children aged eight to 18 years in 2015, 50.3 percent of girls reported reading fiction books or media at least once a month. * All (n= 32,569); Boys (n= 15,414); Girls (n= 16,746); KS2 (n= 7,097); KS3 (n= 20,512); KS4 (n= 4,163); KS5 (n= 695); White (n= 20,614); Mixed (n= 1,642); Asian (= 3,558); Black (= 1,208). Due to rounding, the data in the tables do not necessarily add up to 100 percent.